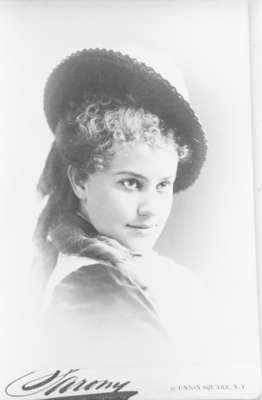 A black and white portrait of May Irwin. This portrait shows a view of the right side of her face. She is wearing a hat. This photograph was from a collection of pictures of theatrical personalities accumulated by Frederick Meserve of New York, a famous American collector of pictures related to Abraham Lincoln and the American Civil War. Bottom Right: 37 UNION SQUARE, N.Y.